Today’s Patawpha Fest at Yokna Bottoms Farm is one of the first events to kick off Oxford’s Green Week taking place April 15-22 (more info about Green Week here). 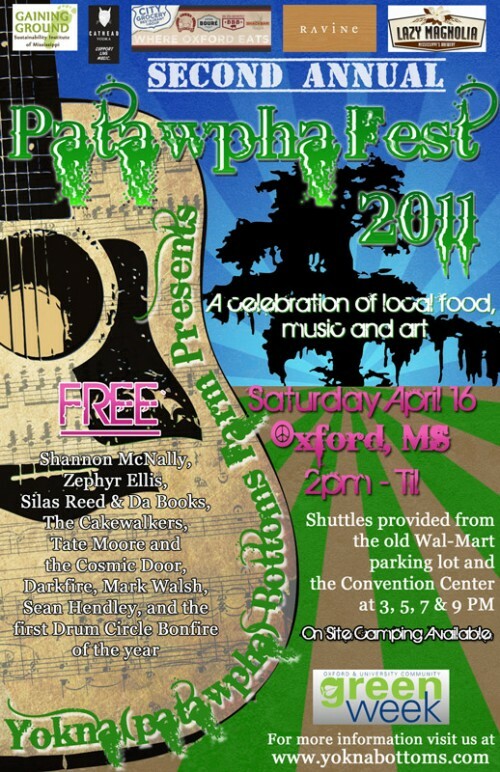 The festival, which starts at 2:00 p.m. and lasts until everyone goes home, will celebrate local food and music (more about Patawpha Fest here). The Honey Bee Bakery will host a Green Week Brunch. The brunch menu will feature fresh local products in season. As patrons taste the local flavors, they may also converse with the farmer himself. Representatives from a local farm whose produce is featured will also be on hand during the brunch. Reservations in advance are suggested. What does it mean to the community when we “Go Local” in practice? This question and the Green Week theme will be explored further through the lens of food—from local farmers, restaurants and to your kitchen. Panelists will discuss what eating local means for our own personal health and the health of the local economy. Experts and “locavore” aficionados, such as John Currence, John T. Edge, Shannon Adams, Daniel Doyle, Michelle McAnally, Mike Stanton and Ron Shapiro will convene what will certainly be a lively, thought provoking, and informative discussion. The Ravine hosts a Green Week Wine Dinner featuring fresh, local produce. At the dinner, a representative from the local farm whose produce is featured will be visiting with patrons to talk about the produce. Reservations are strongly suggested.